It's so funny that I took Garment Sewing 101 in college. Yes, really! I was enrolled in a fashion college for a few semesters and actually dropped out partway through that garment sewing class... It wasn't the class though, I simply realized that career was not for me. I remember we were in the process of drafting a fitted blouse pattern from scratch. Not so easy! And that was on a mannequin with endless supplies of muslin and "ideal" curves. I left the class with lots of experience sewing fancy darts and pleats, but never having sewn a single complete garment and no desire whatsoever to do so. About ten years later I rediscovered sewing when I wanted to make projects for my home. 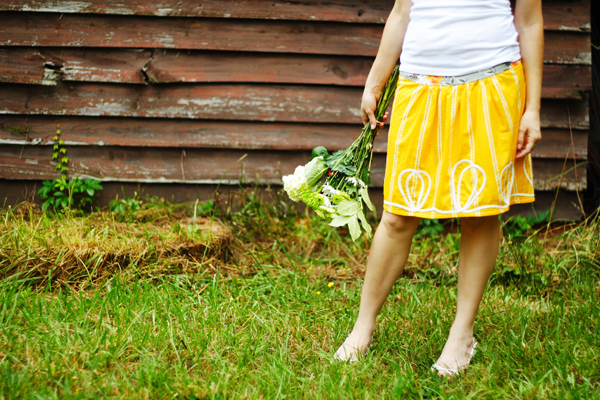 That first summer sewing and blogging, I attended a workshop taught by Anna Maria Horner in which we tackled her Proper Attire skirt. It was such a great way to break the ice on garment sewing for a real person. I mean, who doesn't benefit from a little hand-holding? The resulting skirt even got worn bunches! And I made more! My favorite Proper Attire creation is this yellow one that I embellished as a project for Handstitched Class way back in 2012. I still love to wear Loop de Doo. It is uniquely satisfying to wear my sewing personality in this way. It feels very genuine and joyful. Ok, so great start... but that is where my garment sewing success ends. Well, that's not entirely true as I've had lots of satisfying sews for Aria or Elora. It's sewing for myself that's been a tricky beast. In 2012 I also made a Painted Portrait blouse, another Anna Maria Horner pattern. I made the size medium, as per my measurements, but it fit unflatteringly big. After doing online research, I made some custom adjustments which I describe in this post. The result looked great; however, it doesn't wear well at all. It rides up in the bust area and fits too tight under the arms. I'm sure this is due to my adjustments, not the pattern itself, but it was very discouraging. I discovered I needed to do a "full bust adjustment" to get a correct fit. An internet search on that topic left me running for cover! Back to quilts with their agreeable flat pieces and always-right size. I need clothes. 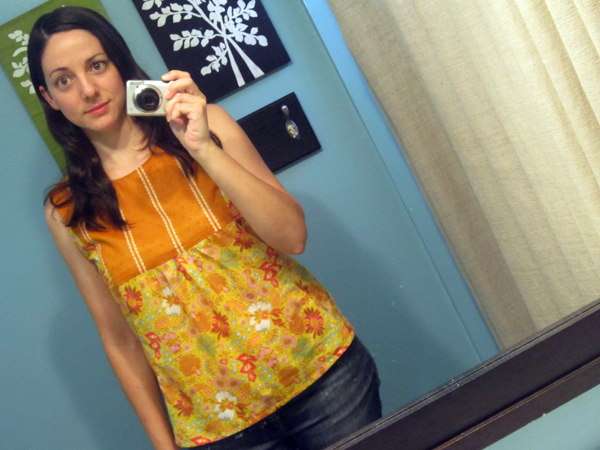 Seriously, it seems like more than half of my meager summer tops are stained or ill-fitting. I don't have a generous budget. Women's clothing can be so overpriced that sewing for yourself may actually be cheaper! It definitely can be more ethical and result in a nicer fit (or so I'm told). I want to wear clothes that are personal and expressive. I've gone too many years wearing plain tees that make me feel "blah" and boring. There are so many lovely garment fabrics coming out now days. It's silly not to use them! Ok, phew, have you read all that? Then you must relate! Well, ladies, I'm ready to make this happen. Or, at least, I'm ready to take another gamble, baggage and all. I'm sewing a Sorbetto top in that lovely Rifle Paper rayon. There's a Colette sew-along to help with fit and the pattern is free so I'm not risking much. They say it's ideal for beginners.